I can’t imagine anything better than starting off your day at the spa, especially if it is an Ummelina Spa, where relaxation through scent and water is the theme. The Yakima location was right in the lobby of the downtown Hilton Garden Inn I was staying at so I didn’t have to go far. I had been spoiled with spa treatments over the past week and I was about to have an experience that would be at the top of the list. My experience began in the quiet at calm of Ummelina Spa with one of their many herb teas. I chose to have the “strong hair & nails” while I relaxed in a soft chair and had my feet massaged. 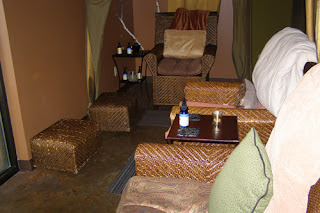 We then moved on to the rain forest room, where I enjoyed the steam and mist in private relaxation before the therapist came in for my salt scrub and body spray. I was in perfect comfort by the time we finished and I then headed into yet another quiet room for my grape wine facial. My face was sprayed, patted and scrubbed until it felt soft and silky. It wasn’t easy for me to leave, but owner Nina Ummel helped me along with a few more treats. 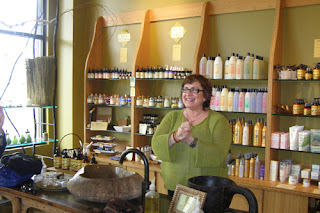 This spa has a line of scented oils, moisturizers and makeups with the same natural ingredients as the spa. I had a great makeover and then left with a few products, including a Peaceful Moments Aromatic Mist to take along on my travels. Yakima Valley’s Director of Tourism, Katie Heaverlo, picked me up and brought me to Prosser’s Vintner’s Village where I was to meet Jordan Young, Director of Marketing for Tri-Cities Visitor & Convention Bureau. We were scheduled t have lunch at Wine O’Clock. 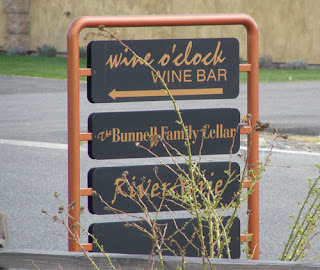 This restaurant is owned by the Bunnell Family, wine producers of the area. Susan and Ron Bunnell, owners of the Bunnell Family Cellars, a house that likes to blend hand processed grapes, took good care of us at the restaurant they opened in January of 2009. I found quite a few wines here I enjoyed, with special note to the 2009 River Aerie Chardonnay, an unoaked vintage with lots of pineapple and florals that is both light and tropical. 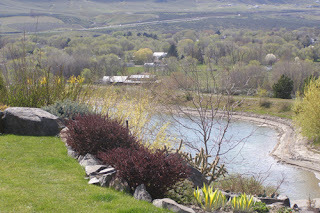 Jordan told me about the Tri-Cities – Kenewick, Pasco and Richland – where there are 160 wineries within an hour of the Columbia and Snake Rivers. It’s the land where the water Washington is known for meets the dessert and a rainy state turns into 300 days of sunshine a year. A place where you can find 10 golf courses that get little snow, and a farmer’s market every night in the summertime. I learned a lot as we enjoyed a great lunch, which included a Morrocan Spice Carrot and Garbanzo Bean Bisque;Savoury and Sweet Pizzetta (pears, bacon, green onions and white cheddar); a Foie Gras with Pistacho and Coriander; Pulled Pork with Asian Spice & Noodles; and a Decadent Brownie with Tahitian Vanilla Whip Cream. Everything was wonderful and I was glad there was time to digest before the next stop. As we got into the Tri-Cities, I noticed a change in the terrain. It was more hilly and colorful and the Columbia River ran through the valleys. Before long we had arrived at Terra Blanca. 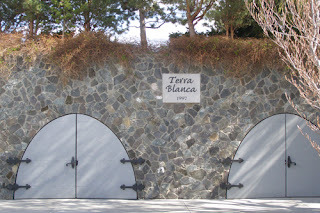 The visit to Terra Blanca was informative, tasty and fun, with a special thanks to Heather Unwin, who had been making me feel welcome even before I arrived. This is a huge landscape within the Red Mountain AVA that even includes caves that reminded me of my visit to Champagne. We started the tour with a 2007 Onyx, a Bordeaux blend that’s mostly cabernet sauvignon, with a bit of merlot , cab franc and petite verdot. It had a typical cab sauv cherry nose, with a peppery and tobacco taste the was a bit different as I was soon to learn was typical of Red Mountain. The tour took us through the winery as I learned how the floods 40,000 years ago created this unusual land between three mountains that would produce memorable wine. There would be quite a bit of it here and I would also learn that a pattern was emerging in the area not of the strong reds as everyone expected, but in the unoaked chardonnays. It seemed that Columbia Valley’s chardonnay grapes could stand up on their own and produce without needed heavy wood behind it. The other emerging grape her was demonstrated well by Terra Blanca in the 2006 Merlot, full of blackberry, plum and dark raspberry, with a hint of spice. 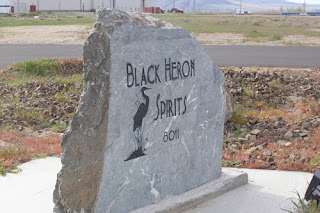 I had a bit of a wine break at Black Heron Spirits, a brand new distillery in the area. Owner Joel Tefft is actually a former winery owner who has gone over to “the other side” and I think he’s made a good transition. The Desert Lightening White Whisky is made with locally grown corn and is quite good. Huckleberry Cordial is brandy-based and full of fruit, without being overly sweet. The Limoncello is made from a grape vodka and includes lots of zest. A Rayn Anjel Gin is very different than any I’ve had in that spirit, light on the juniper and full of sage and lavender. We finished up with the Ink, a barley vodka that somehow has hints of vanilla grape and even a bit of chocolate. 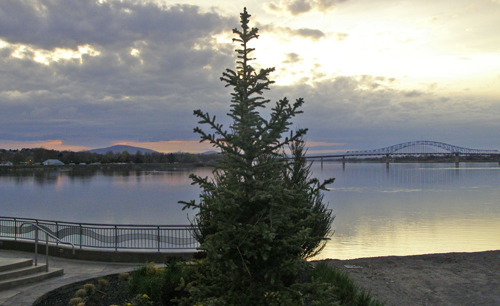 Jordan dropped me off at the Courtyard Richland, a new hotel with a great view of the Columbia River from the balcony of my suite. I had a nice walk and soaked in a bit of sun before he picked me up for dinner on Clover Island. Just before we went into the restaurant we got to see a colorful sunset over the bridge. It was one more reminder that I have managed to avoid virtually all rain during my Washington trip. We then ate at Cedars Restaurant, where I started off with a Washington Apple cocktail, Crown Royal, Apple Pucker Schnapps and cranberry juice on the rocks. It was a nice mix of sweet and sour. I had the Chicken Marsala for dinner with the Hogue Riesling and a bit of crème brulee for dessert. I was soon back at the Courtyard for some sleep before my early breakfast and day checking out some more of Tri-Cities before I head to Walla Walla. Ron and Susan just kill it at Wine O'Clock!